The Long Island Regional Spelling Bee recently took place March 18th at Hofstra University, with over 100 spellers from schools all over Long Island coming together to compete. With words like “succotash”, “parquet”, “soliloquy”, and “adnate”, it’s no easy task either. Many spellers study for months, even years before the big day comes around. The spelling bee is such a fun experience! You can find so many amazing people that simply love to compete and spell. And it’s a great feeling when you’ve studied so much and it all pays off. Participating in the spelling bee is tons of fun, but it’ll take a lot of hard work too. There are four spelling bees: the classroom spelling bee, the school spelling bee, the regional spelling bee, and the national spelling bee. Each bee uses its own rules and a certain packet of words to study. It’s recommended that you learn these rules and packets very well, as most other competitors will be too. Lots of competitors memorize the packets, so that means you’ll have to too! Flash cards are good for that kind of thing. The classroom spelling bee uses the study words you’ve probably gotten from your English teacher, and it’s the very first step. As long as you study and are dedicated to your goal, you’ll probably make it through. The school spelling bee is the same way, just that it’s likely you’ll go farther down the list than in your classroom bee. It’s even possible you might go off the list and start spelling completely new words! The regional spelling bee is a little different. You’ll receive a bigger packet, this time with about a thousand study words! It’s sorted by language which is much better for learning than by grade level. There’ll be a preliminary paper test containing vocabulary questions so you’ll definitely need to do some studying. After the paper test, you’ll have to go through a preliminary oral round, where you only need to spell one very simple word like “geothermal” or “character”. Occasionally there’ll be an unfortunate kid that receives a harder word, so just cross your fingers and hope your word is one you’ve studied. After the preliminaries, you get a nice lunch break, and then you’re back in action. Usually 2/3rds of the competitors are knocked out, and 1/3rd is left in the finals. From there it’s a complete battle, and it’s then that the people who didn’t study are weeded out. Gradually the words start going off the list… and eventually you’ll find yourself running on simple skill. It gets pretty spectacular by the end. If you’re interested in the bee, here are some tips! Dig around the internet. The national spelling bee is broadcast on ESPN when it happens… watch it! Sorry, but you’ll probably want to memorize the study packets. There are quizlets you can find online for that. The more you know about a language, the better you’ll spell words from that language. French and Spanish classes will really help you in this way. Try to get a ‘feel’ for every language. Words from different languages are spelled differently… take for example “schadenfreude” which is from German, and “wikiwiki” which is Hawaiian. If you have any questions, I’d be glad to help. Good luck, future speller! The month of March has played host to many historical events that have changed our world. Here are a few of these events. On March 1st, 1781, Congress passed the Articles of Confederation, which was basically a temporary Constitution, as the laws that the people of the U.S. should follow. Then, 180 years later, on the same day, President John F. Kennedy created the Peace Corps, an organization that sent volunteers to developing countries to help with everyday needs, such as healthcare, education, and more. On the 4th of March, 1933, Franklin D. Roosevelt delivered his first of four Inaugural Addresses in which he famously stated “All we have to fear is, fear itself!” On March 5th, 1770, a group of British soldiers who were being harassed by colonists opened fire and killed 5 people, and injured 6. On March 6th, 1836, Texas rebels were defeated in the Battle of the Alamo, in which all nearly more than 100 defenders were killed by Mexican troops led by General Santa Anna. On the 9th of March, 1864, Ulysses S. Grant was named Lieutenant General of all Union forces during the Civil War. On March 10th, 1862, the first issue of U.S. government money made out of paper started as $5, $10, and $20 bills went through circulation. Eighteen years later on the same day, the Salvation Army was founded in the U.S., created in England by William Booth, and today operates in over 90 countries. On March 15th, 44 B.C., Emperor Julius Caesar of Rome was assassinated in the Senate Chambers by opposing senators. On March 16th, 1968, Democrat Robert Kennedy announced his run for president of the United States. On the 23rd of March, 1775, Patrick Henry stated the famous quote “Give me liberty, or give me death!”, therefore igniting the revolution. On March 24th, 1989, one of the largest oil spills in history occurred when the tanker Exxon Valdez went aground on the coast of Alaska, and while trying to safely transfer all of the oil out of the ship, it accidentally released over 11 million gallons of oil into the Pacific Ocean affecting wildlife in a radius of over 45 miles. On March 25th, 1809, the British Parliament abolished the slave trade after a long campaign by Quakers and others to stop it. On the 26th of March, 1979, the Camp David Accord with President Jimmy Carter ended over 30 years of fighting between Israel and Egypt, when Israeli Prime Minister Menachem Begin and Egyptian President Anwar Sadat signed a treaty of peace. On March 30th, 1981, recently elected President Ronald Reagan was shot under his left arm after making a speech in a hotel. And, on March 31st, 1968, Lyndon B. Johnson announced that he would not seek re-election after everything that was going on in Vietnam. Now we move on to 10 well known birthdays. Glenn Miller, a famous musician of the 1940’s, was born on March 1st, 1904. Alexander Graham Bell, the famous inventor of the telephone, was born on March 3rd, 1847. Michaelangelo (not the turtle), the famous Renaissance artist, was born on March 6th, 1475. Amerigo Vespucci , the man who technically was the actual one to discover America, was born on March 9th, 1451. Albert Einstein, the famous scientist who also created the famous equation E=mc2, was born on March 14th, 1879. Andrew Jackson, our 7th president and famous American war hero, was born on March 15th, 1767. James Madison, our 4th president and president during the War of 1812. Grover Cleveland, our 22nd and 24th president and the only president to serve 2 nonconsecutive terms, was born on March 18th, 1837. Johann Sebastian Bach, the famous orchestra conductor of the early and mid-1700’s, was born on March 21st, 1685. Harry Houdini, the world famous escape artist, was born on March 24th, 1874. John Tyler, our 10th president and the first to one to have become president because of the death of another, was born. Vincent Van Gogh, the famous artist who painted Starry Night, was born on March 30th, 1853. I hope you enjoyed this edition of This Month In History and can’t wait for the next installment! Bye! 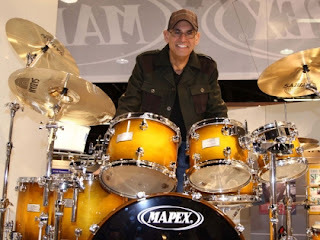 Liberty DeVitto is Long Island Rock and Roll royalty. He’s best known for his thirty years as the drummer for Billy Joel on classic albums, such as “The Stranger”, and “52nd Street”, all the way through Joel’s last studio album “River of Dreams”. He has played before millions of fans across the globe and has been one of the most sought after studio drummers for other music legends. I got to ask him a few questions about how he got started, some of his most famous (and favorite) songs, and his latest projects. Here is my interview with native Long Islander and Long Island Music Hall of Fame inductee, Liberty DeVitto. Who inspired you to start playing the drums in the first place? I had asked my father that question not too long ago. He said they didn’t make Prozac back then, so the drum allowed me to get my aggression out. But it was seeing the Beatles on the Ed Sullivan show that inspired me to become a musician. Were you in band in school? I was when I was in sixth grade, but believe it or not, I couldn’t do the buzz roll in the Star-Spangled Banner, so the teacher said “Put the sticks down DeVitto, you’ll never do anything with the drums.” I was so upset by his comment that I stopped playing until the Beatles came on American TV. I was 13 years old. When did you first join a band outside of school? Not long after the Beatles first came to America. I think every kid got an instrument and started a band. I did. We weren’t very good, but I loved it. What was it like the first time you heard yourself play on the radio? You have a very physical and aggressive style in concert. Do you have to alter that in the studio? I still play hard in the studio but not as “flamboyant” as live. There is no need to be a showman in the studio. Sometimes, it’s the way I tune the drums. In “Only the Good Die Young”, I tuned the snare drum so the head was very floppy. Depends on the song. Was there a particular song or songs that you looked forward to playing every show? Because I do play very theatrical with a lot of movement, I enjoy the ballads. “Honesty”, “Vienna”, and “Until the Night” were some of my favorites. In 1987, you toured with Billy Joel for 6 concerts in the Soviet Union as one of the first western artists to play there. What surprised you the most about playing there? The people. They were very thankful we came to play for them. I learned that all people are the same and nobody really wants to be enemies. It’s the governments that seem to start all the trouble. Aside from Billy Joel, what other musical artists have you performed with? Sir Paul McCartney, Sir Elton John, Sir Mick Jagger, Steve Miller. Last night, I just played with John Popper from Blues Traveler! I’ve been playing drums for 3 years now. Is there any advice you can give me and other drummers on how to get better? Practice a lot. I am self taught- never took lessons. Records were my books. I use to put my headphones on and try to imitate the drummer on the record. Any drummers, aside from yourself, that you’d recommend listening to? I’m kidding! My heroes that I listened to were Ringo Starr, Dino Dinelle, Ginger Baker, Jim Capaldi, Mitch Mitchel. Then Bernard Purdy and Steve Gadd. I would recommend listening to Larry Mullen from U2. He plays to the song. Or my friend Kenny Arronoff. He is another song writers drummer like me. Congratulations on being inducted into the Long Island Music Hall of Fame and getting back together with the Lords of 52nd Street, Billy Joel’s original back up band with Russell Javors and Richie Cannata. What’s it like playing live with these guys again? It is great being with old friends again playing the music we helped create. I had to learn my parts all over again. It had been so long since we played those songs. How did you choose a singer for the group? We needed a guy who knew the songs and was a fan of the music. Dave Clark has a tribute band so he had been playing the songs for a long time. How did you get involved with your new band The Slim Kings? I love classic music but I didn’t want to be in a classic rock band. The singer in The Slim Kings is 31 years old, and the bass player is 28. They bring new ideas and me, the “old school guy” shows them how it is done! Nostalgia is very popular in music today. Bruno Mars is a great example. He sounds like Prince and James Brown. Also, congratulations on your daughter’s success as an actress! What’s it like seeing her on NBC’s “Chicago Med” every week? I have to pinch myself. I am very proud of her as I am of my other two daughters. I also hear you are very involved with an organization called “Little Kids Rock” that helps school districts set up music classes and delivers brand new instruments to them. That’s awesome! How can people find out more? You can find this all out here http://www.littlekidsrock.org/about/what-we-do/ and through Sabian Cymbals, who are a huge supporter of “Little Kids Rock”.